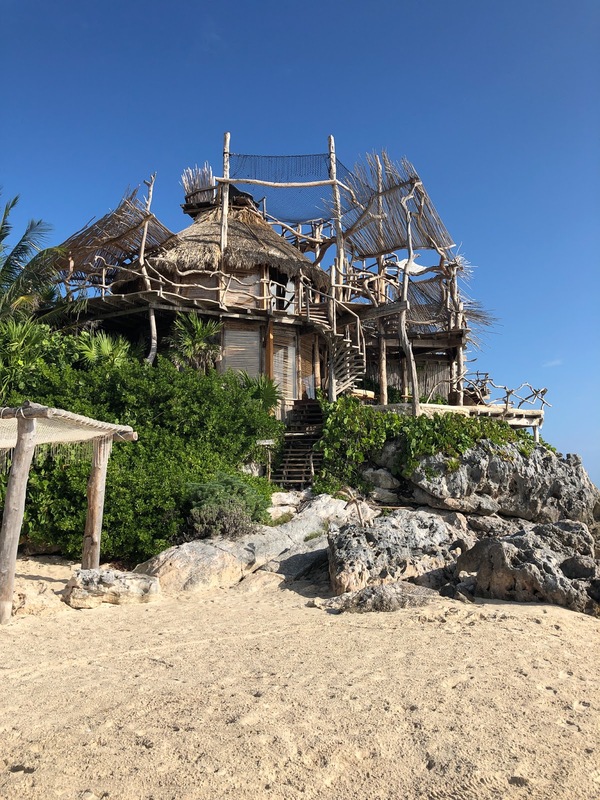 Not many know this (unless you’ve read my post about it on Instagram), but growing up I used to spend summers in Tulum, Mexico with my mom and dad. We would stay in little huts along the beach, collect seashells and watch the stars at night. These summers are my happy place. I didn’t realize how much this shaped & meant to me until I returned recently. 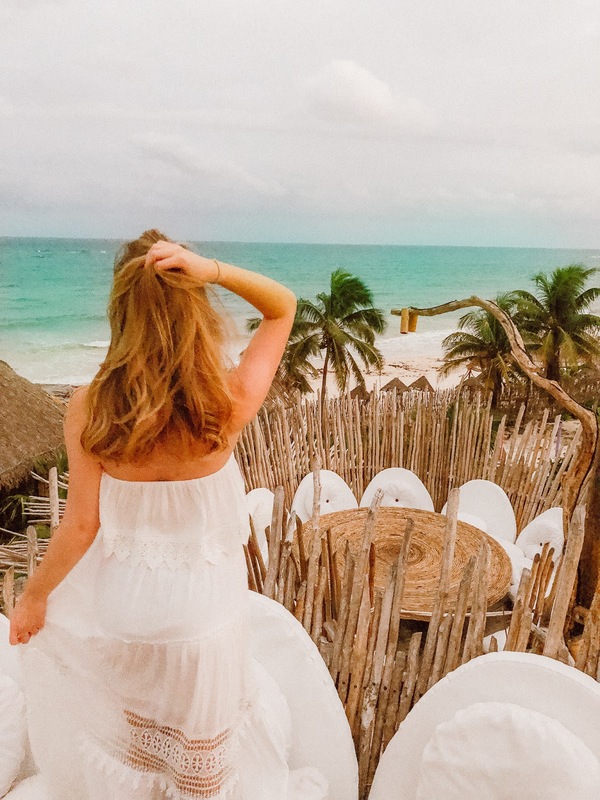 Tulum is filled with resorts & tourists now, but the sun, beach, and stars are just where we left them. 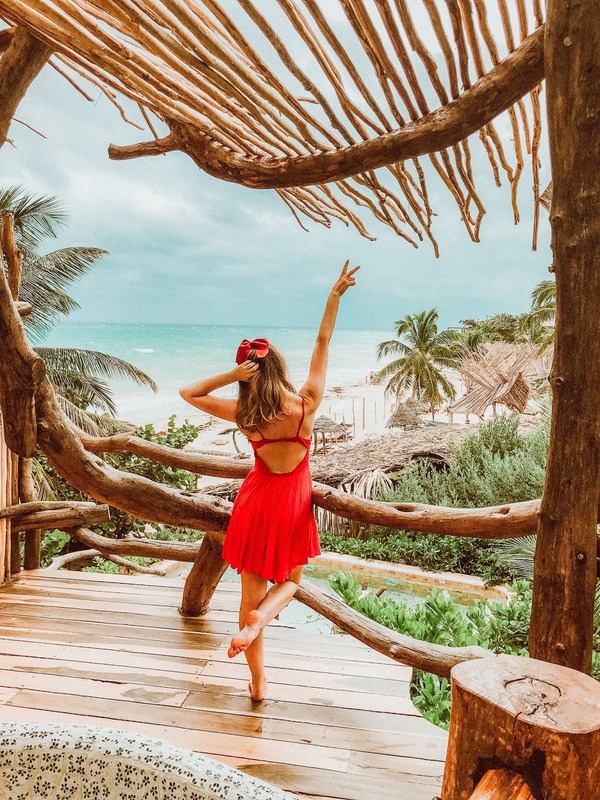 Going back for the first time in probably 15 years, I wasn’t sure what to expect, but as I stepped out of the Cancun airport, I immediately felt like home. 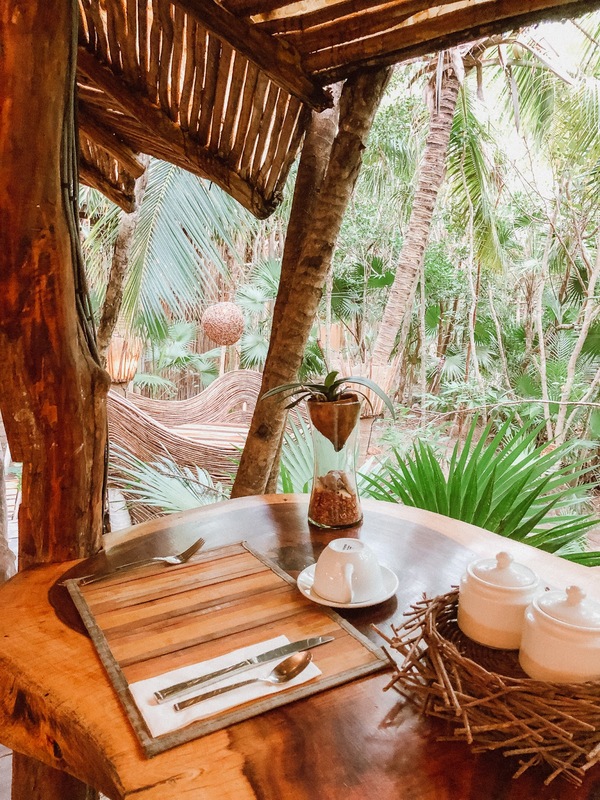 For the first two nights of our stay, we called the dreamy Azulik Treehouse Resort home and allowed our circadian rhythms to be reset with candlelight and the sound of the waves crashing on the shore. Read on for a photo tour and to learn more about what makes this resort so unique and special. 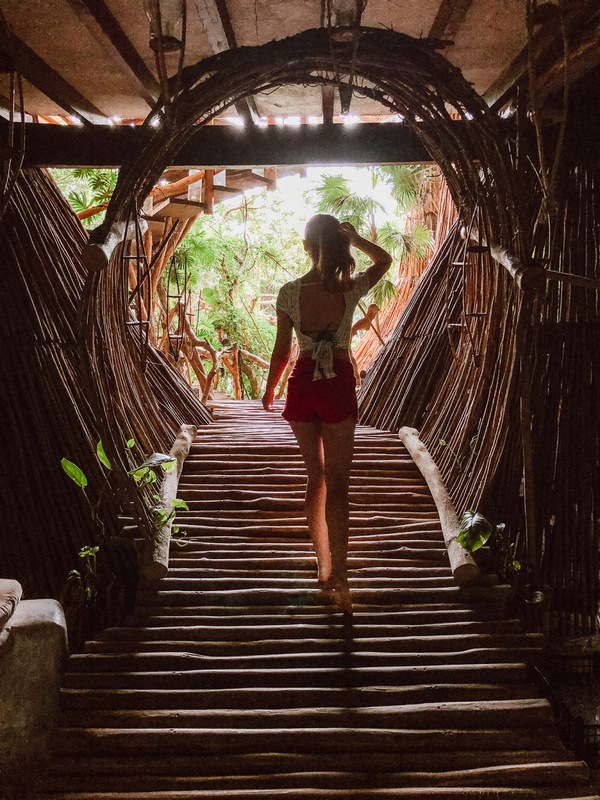 Azulik is the most unique and incredible resort I’ve stayed at to date. 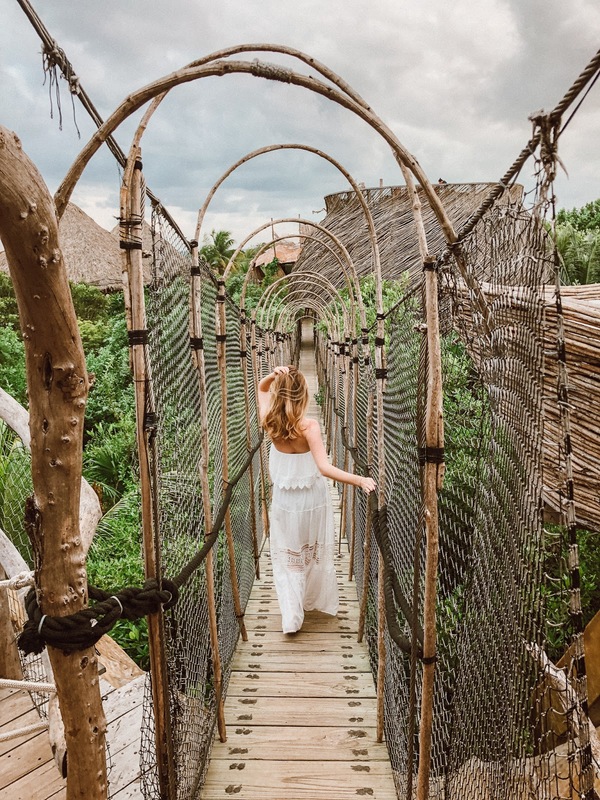 With its open feel and focus on getting back to nature, Azulik is the perfect getaway to relax, reset, and check in with yourself. 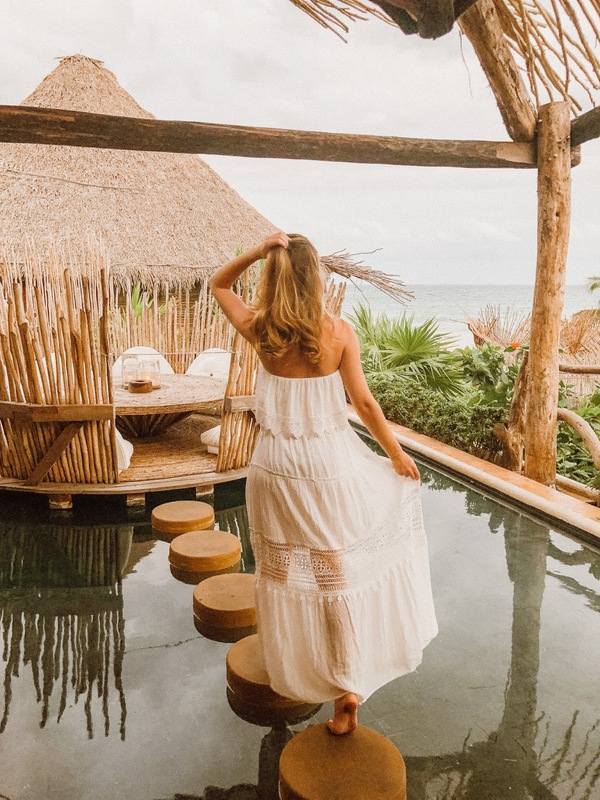 I mean, just look at the stunning beach view from our private balcony in the Aztec Villa. This resort pulls from the 4 elements – water, fire, earth, and air. 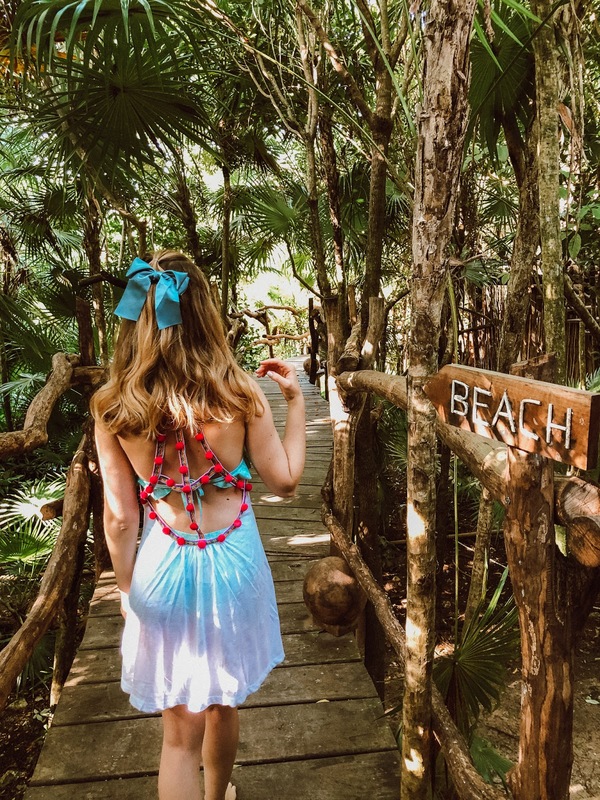 Surrounded by the Carribean Sea, water is the biggest emphasis here and can be found in each experience at the resort, including water paths that wander from the lobby to the spa deck. First of all, the word treehouse does not do Azulik justice. 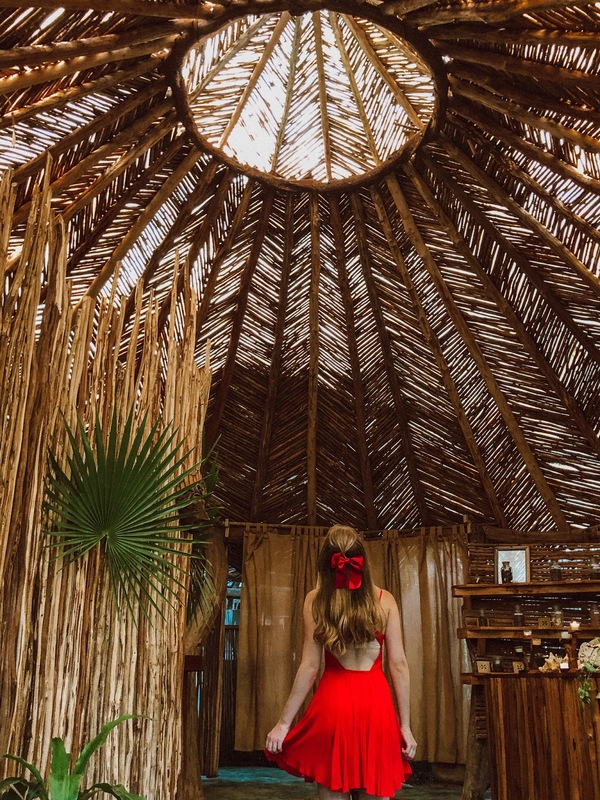 It’s more like a work of art in the Mayan jungle, with many stories of wooden pathways and rooms snaking through seemingly endless green palm trees and copal incense – a local treat which has the dual function of keeping the mosquitoes at bay and aiding in relaxation. 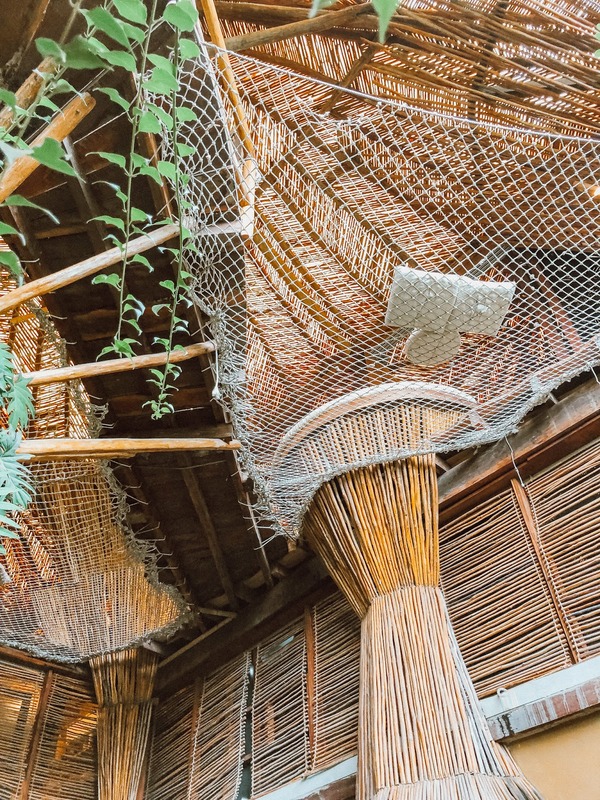 Even non-guests can visit the famed Kin Toh restaurant – renowned for its lounge-worthy netting which overlooks tropical treetops a story or two above the ground. I don’t consider myself afraid of heights, but even I didn’t want to look down for too long on here! It’s a fine dining restaurant (18+, no swimsuits allowed), with a fun bar, neon hookahs and even a small lounge / dance floor with DJ. Kin Toh opens at 5:30 PM, and I would make a reservation and get there a little early if you want to get shots on these nets (there will already be a small gathering of people just before 5:30). 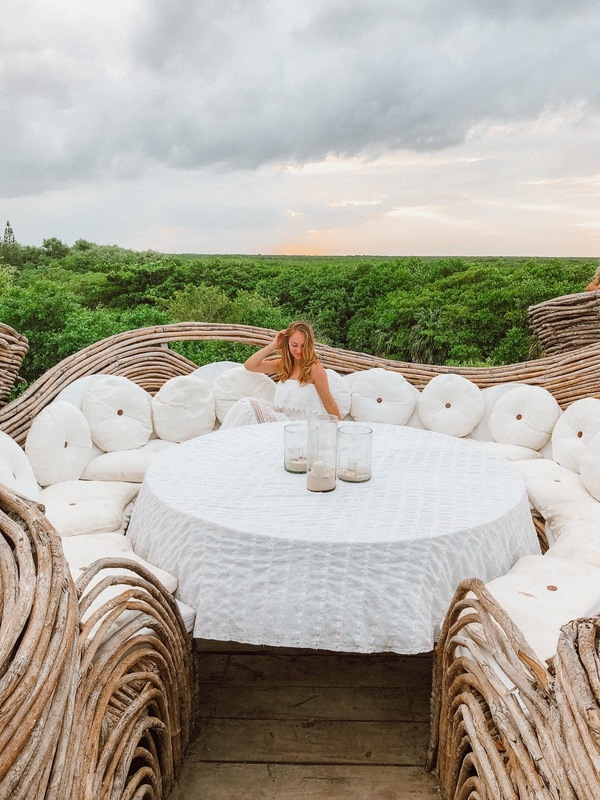 It’s free to enter as long as you order something, and they also offer a champagne sunset which gets you access to their “nests” (see below). I dished on my Insta that this treetop view totally reminded me of Jurassic Park. I was surprised by how many people agreed, glad I’m not the only one! 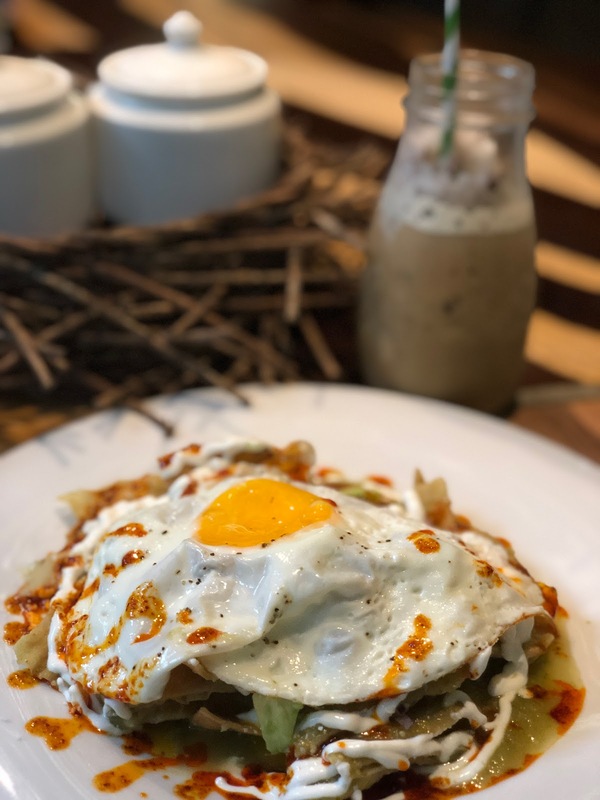 Kin Toh offers Mayan-Mexican fusion cuisine using local, seasonal ingredients so it’s as fresh as it gets. The presentation of everything here is incredible. 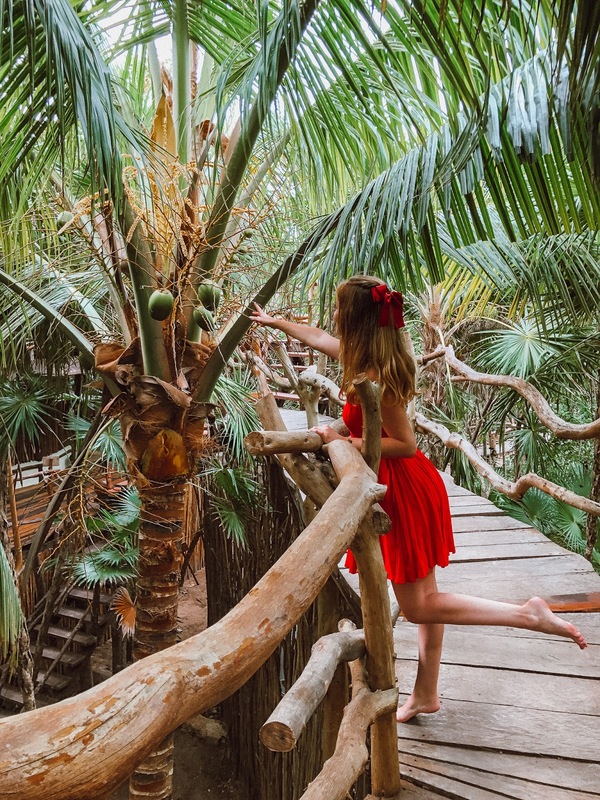 Guests have access to the roped off treehouse area where the rooms are located. 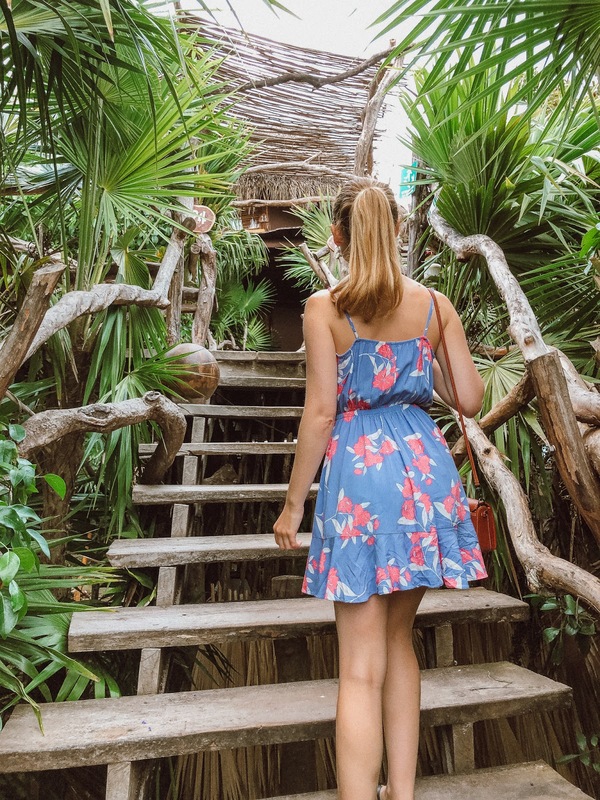 I couldn’t get enough of wandering along the treehouse pathways and steps. They were all lined with those spheres on the ground, which lit up at night since there is hardly any electricity in Azulik. 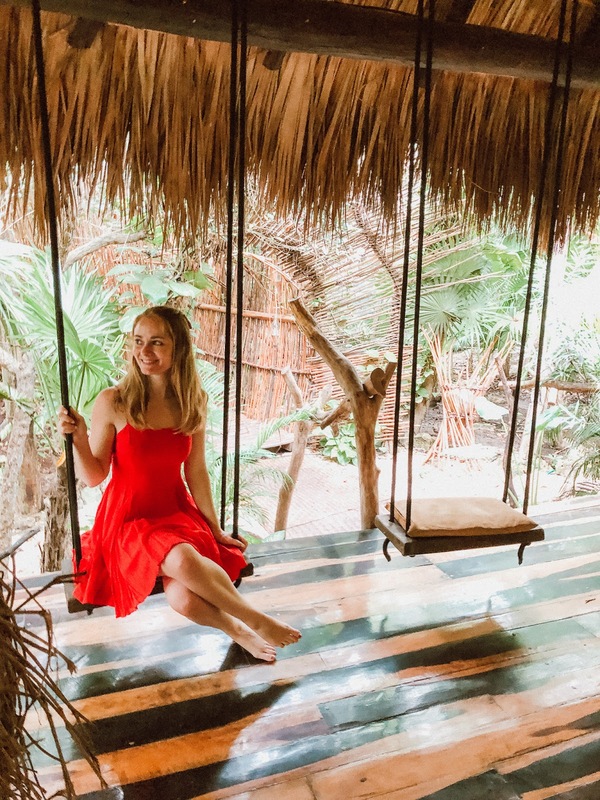 To my delight, swings are ubiquitous in Tulum. It’s hard to worry about anything when you’re on a swing! 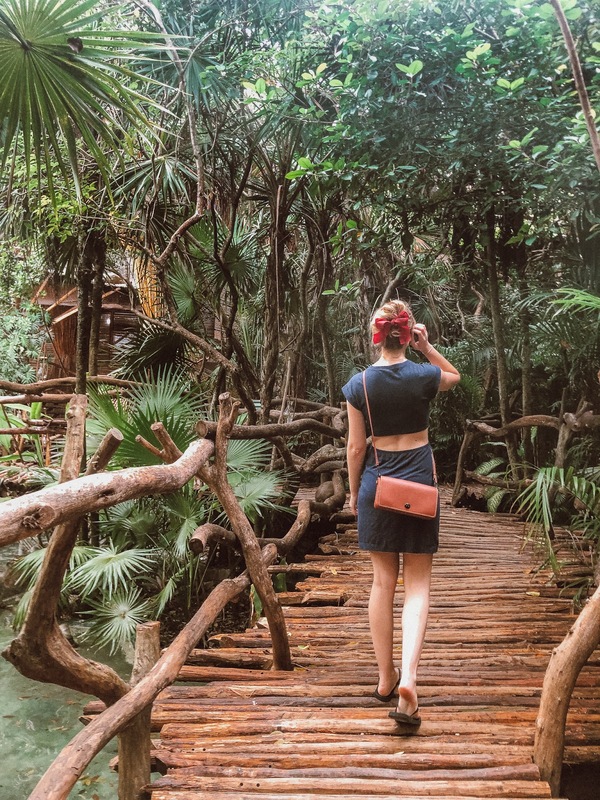 The entire resort is expertly engineered to meld nature and art. It’s a high-end resort, so everything is intricately designed and somehow luxe while keeping you rooted in nature. 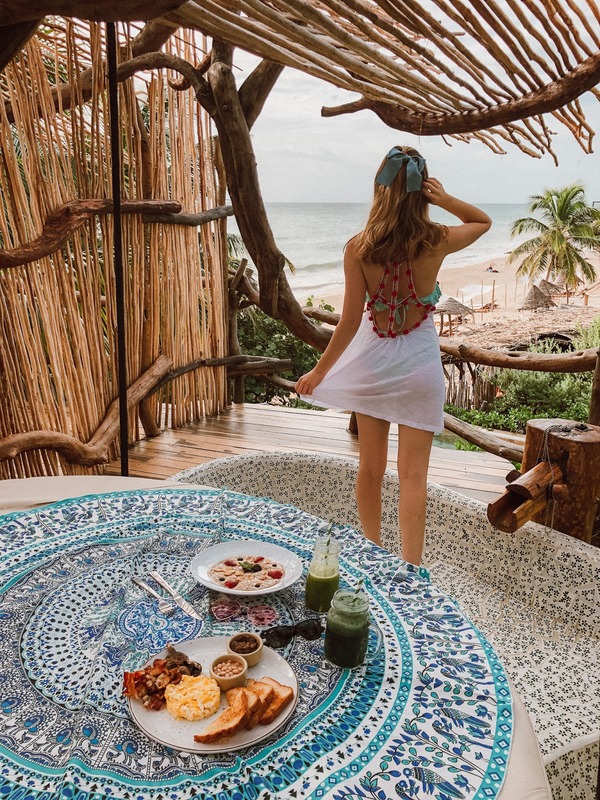 If this isn’t relaxing enough, they have an on-site spa which includes massages and a complimentary “cleansing,” which uses incense and shell sounds. If you’re pressed for time I would say you can skip the cleansing, it’s only about a minute and I think it’s better spent in a villa or on the beach. Are you ready to see our room? The Aztec Villa is all about comfort, and is focused around the fire element. Glass-covered candles line the sink, walls, and table. 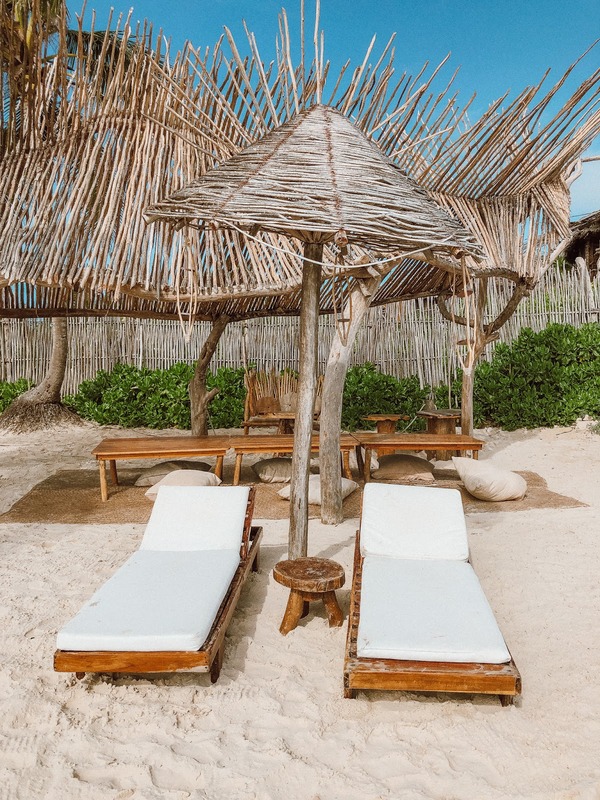 Azulik lists fire as an active and rejuvenating element, and teaches the importance of relaxation in getting back to nature. As a child in Tulum summers, I remember there being a ton of mosquitoes at night (especially along the beach). This time around, we went in late November and I hardly saw any mosquitoes at all. It’s also a great time of year to visit since the crowds are down and it’s not too hot. To be fair, I actually did get quite a few bites, but those were from the days I forgot to put Deet on (and at least I didn’t have to hear or see them). That said, Azulik is prepared with mosquito netting and a fan over the (extra king-sized) bed in case you need it. As you can see, in keeping with the treehouse and nature theme, we didn’t have solid walls surrounding the room. Instead, we have floor-to-ceiling glass windows and doors with wooden blinds providing a bit of privacy. Many of these can be fully opened for even more connection to your surroundings. To aid in getting back to nature, there is very minimal electricity in Azulik. Our room had 2 outlets to charge our phones and that’s it – which was actually incredible. No wifi, no electric lights, just many candles which are lit for you when you get to your room at night. I’m a total night owl and have trouble getting to sleep on time, but by circadian rhythm reset so fast here. I fell asleep easily after the sun set to the waves crashing on the shore, and woke up with the sun rise, excited to take on the day. It was actually so telling of how modern technology affects our bodies, and even writing this right now reminds me to put away technology late at night to try to reset my inner clock. Ah, the intricate, mosaic tiling & mirror work. 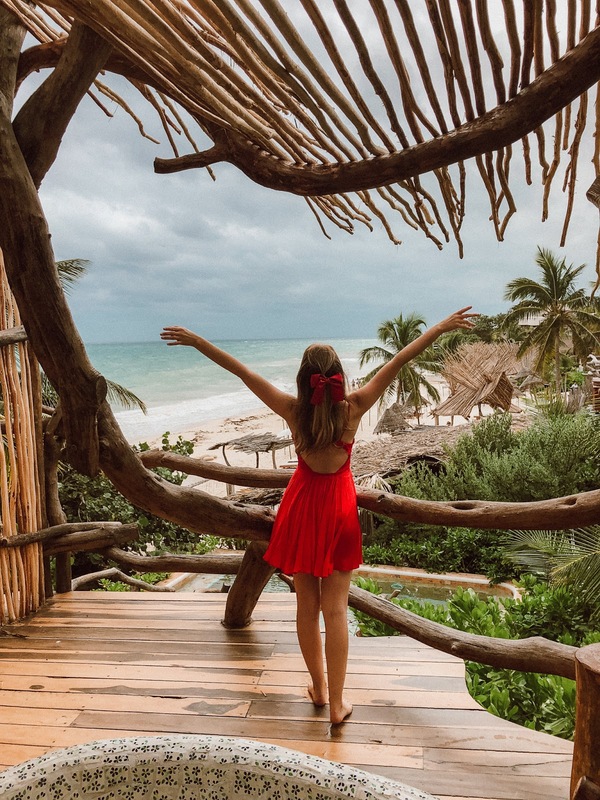 This is something that really brings me back and is found a lot in Tulum. It’s little touches like this that bring joy to your day. Show me a cuter bath, I dare you! Obsessed is an understatement when you consider the handmade mosaic tile work, wooden faucet, tri-mirrors and hanging towel rack and soap shelf (no detail left untouched here). Water is supplied from the on-site cenote – aka underground water source. 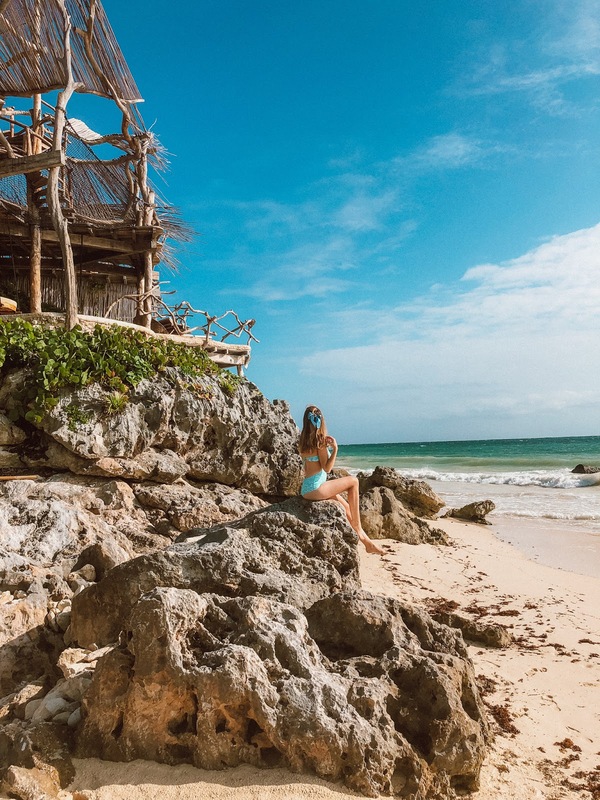 I know travelling can look super luxurious and dreamy, but we spent so much time exploring Tulum, Azulik and the beach (and getting shots for the blog and brand collaborations), that I didn’t have enough time to ACTUALLY take a bath here! 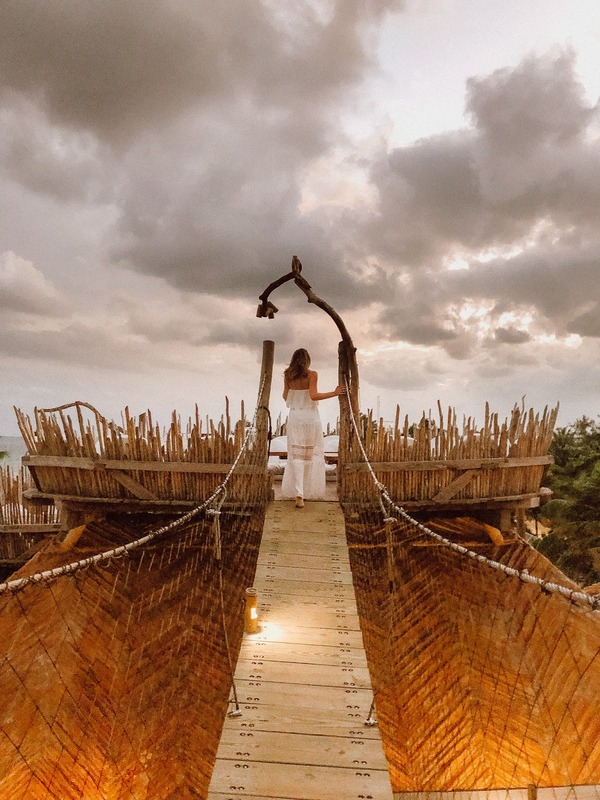 One of my goals this year is to work on balancing work for the blog with being in the moment and truly experiencing where I am – especially on epic trips like this. Does anyone else struggle with this? How cute is this rustic closet! My favorite part of Azulik right here. 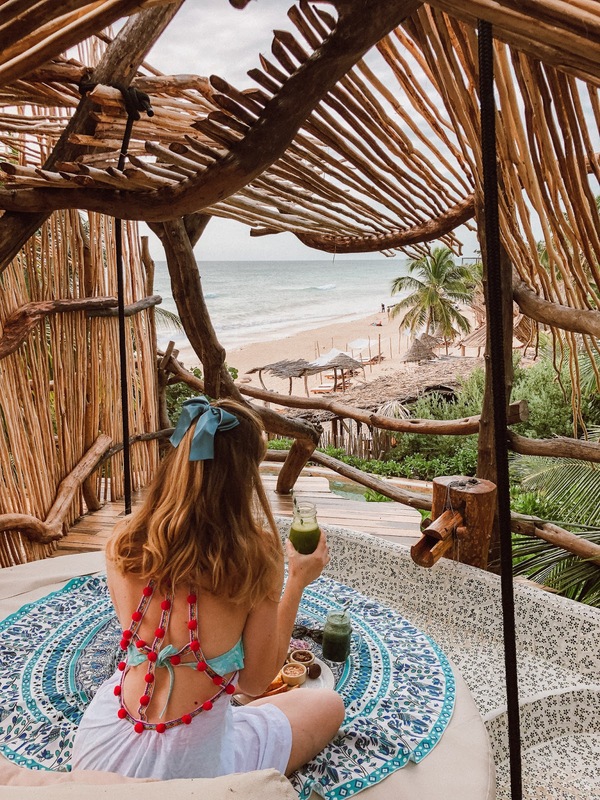 Our private balcony, complete with a ginormous hot tub (there are hot and cold dials on the faucet so it can be made into a regular bath), swinging daybed, and view of Tulum beach. Oh, did I mention the room service? 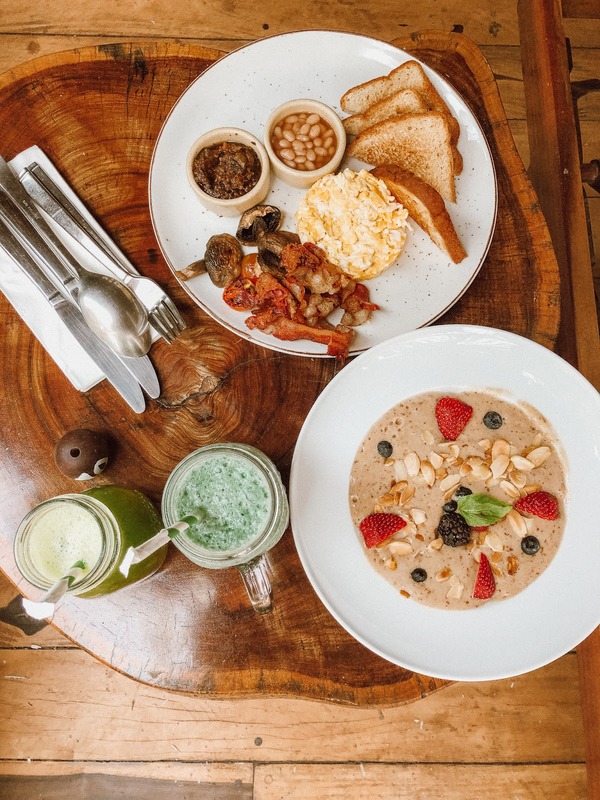 It comes from in-house restaurant Cenote (more on this later), and is incredibly delicious, including English breakfasts, smoothie bowls, and fresh juices (with paper straws of course). But how do you order room service without a phone, you ask? Well, you write your request on a piece of paper, roll it up, put it in a wooden ball with your suite number painted on, and drop it down a shoot! You really have to let go because there is no confirmation that they even receive it. It’s just a different way of life here – much more laid back. The first time they brought it back because the paper fell out, but the second time it worked. 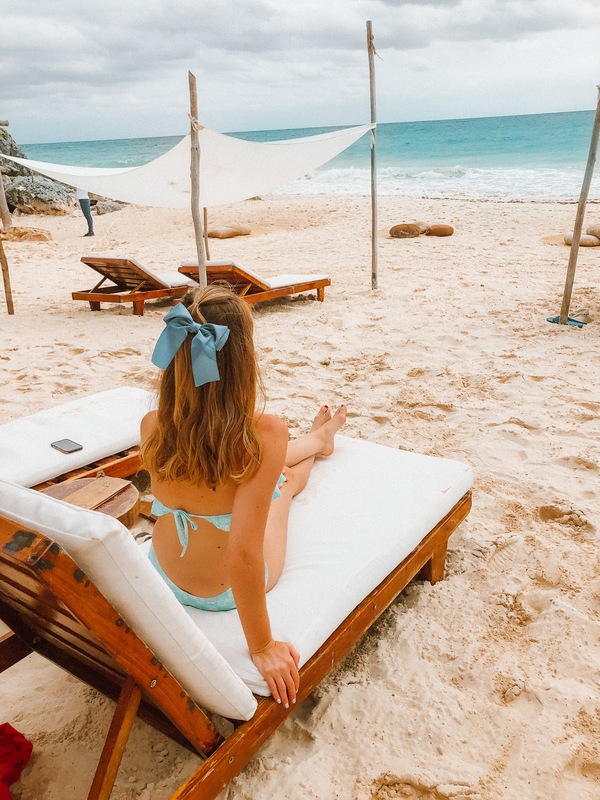 We loved our moments of relaxation on the daybed, watching the waves during the day and the stars at night (SO many stars)! Fully obsessed with the wooden faucets here. Forever reaching for those goals! Something about this spot and view made me stop and stare every time. 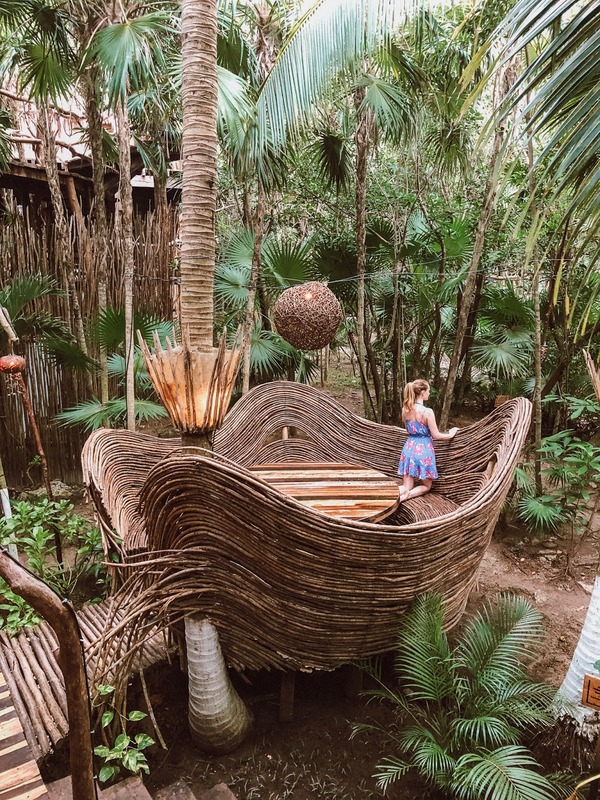 Cenote is a picturesque farm-to-table jungle restaurant on the first floor of Azulik. 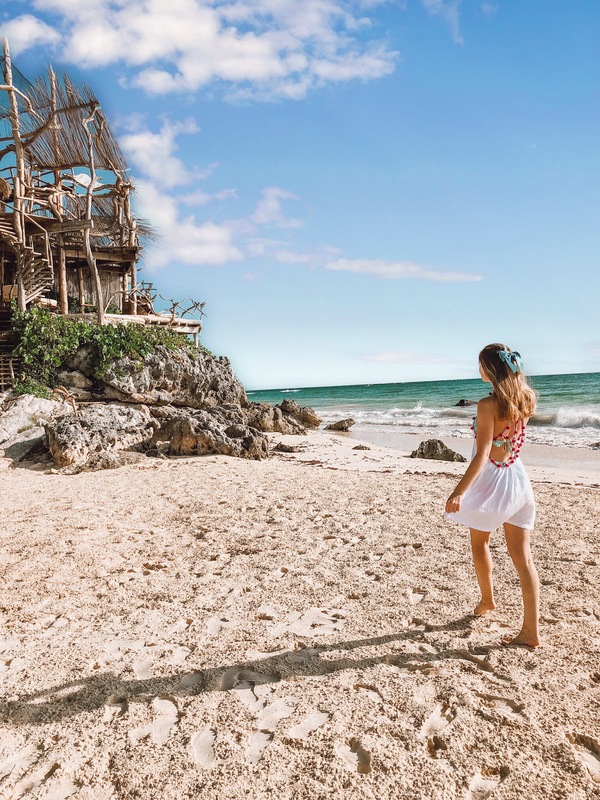 Azulik’s section of Tulum Beach is beautiful. 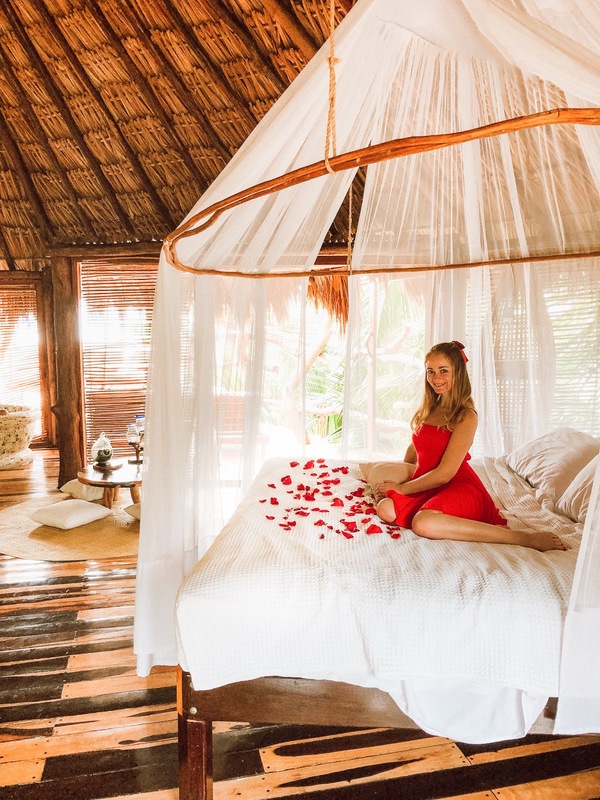 From views of their rustic seaside suites, to circular lounge beds and more raised netting to perch on, you can really lay out here all day. It is clothing optional though so don’t be alarmed if you see that! Again, different place, different way of life. Cross that bridge when you come to it. We stumbled upon Tseen Ja restaurant on accident by taking this long bridge from Kin Toh. Have you seen a prettier restaurant table? We continued our exploration and found our way above the trees again. You can tell by the clouds it was stormy. Shortly after these shots, the sky broke into warm Mayan rain. Remember those spheres I showed you earlier? This is what they look like at night to light the path to your room. 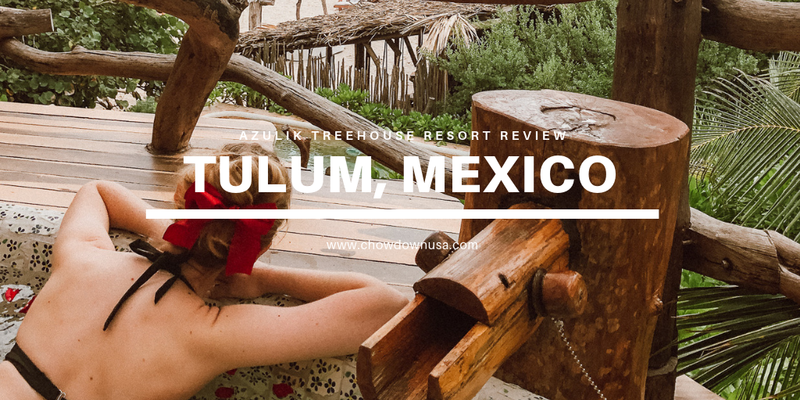 I was excited at the prospect of staying at Azulik, but I didn’t realize just how special and unique it would be. 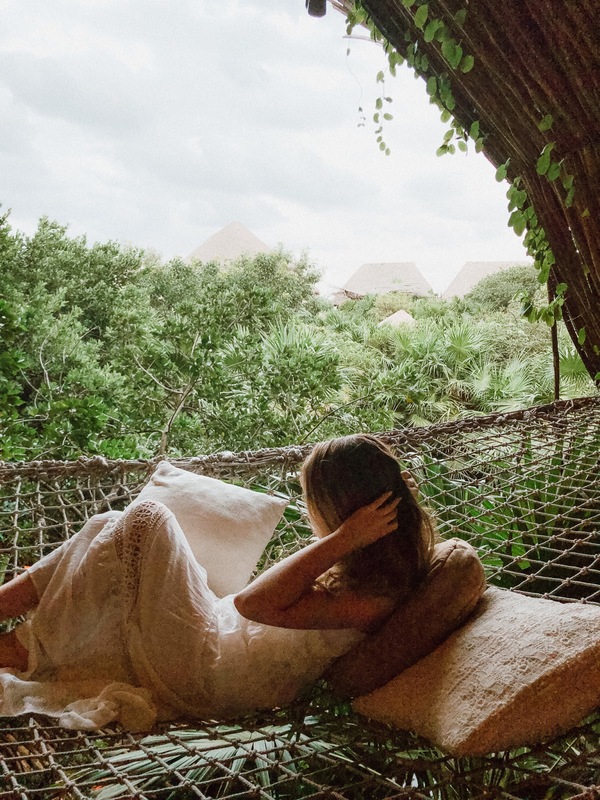 It’s the perfect combination of getting back to nature and intricate design & comfort, which really allows you to relax and reset yourself. 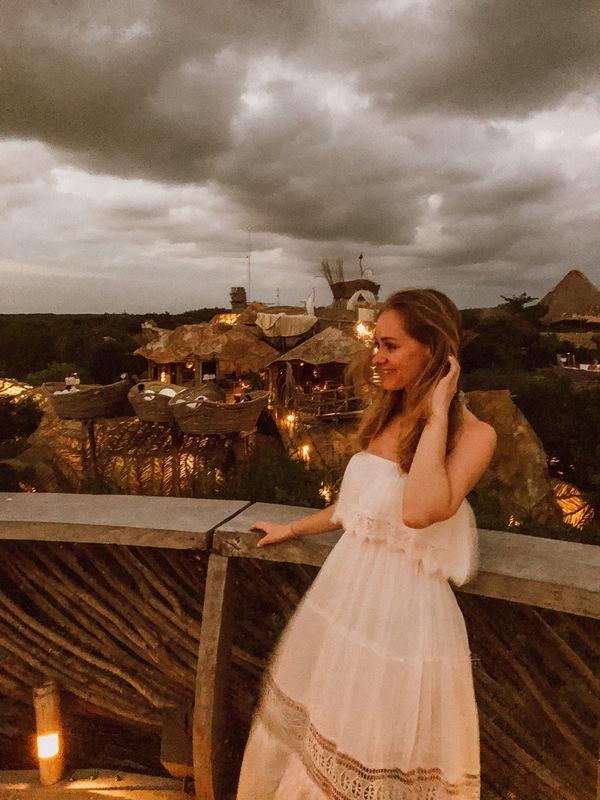 From our villa, to the room service, to the views and incredible gastronomy, I can’t recommend Azulik Tulum enough for a once-in-a-lifetime experience! What’s the coolest hotel you’ve stayed at? 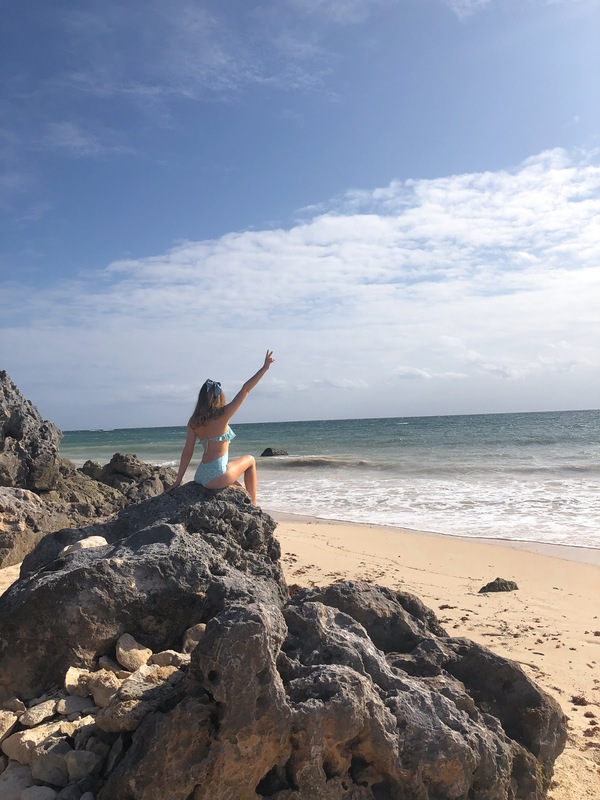 Be sure to check out my other travel guides below!